One of the irritations of being a politician must be that after a lifetime’s work, you are often defined in the public imagination by a single incident (think Malcolm Fraser and the Memphis Trousers Affair). I’ve recently been reading Paul Ormonde’s biography of Cairns, A Foolish Passionate Man, and was struck at how true this of him, and how unfair it was. Cairns is now remembered for the so-called Morosi Affair, when his political career came to an abrupt end following a friendship with a staffer, Juni Morosi, who was not only outspoken but glamorous, confident, female and ‘of mixed race’. These were multiple crimes against the status quo of 1970s Australia. When he began to speak publicly of society as ‘not just a market, but a community’, and announcing that real social change would not happen until we all learned to love one another, there was sniggering and rolling of eyes on all sides of politics. The knives came out. In the aftermath, he was a prime mover in establishing the Down to Earth conference-festival (soon to be known as Confest) and spent the remainder of his life promoting ‘alternative’ views which would become more and more popular among young people, when he was already in his sixties and seventies. In a sense, Cairns’ tragedy was that he was a man before his time. His role as de facto leader of the anti-Vietnam War movement in the 1960s, his part in bringing the White Australia policy to an end, in beginning the work of tariff-reduction while minimising the impact, and opening up relations with China … in all of this acted with a conviction and moral purpose which would shame most modern politicians. Image: © Rennie Ellis. 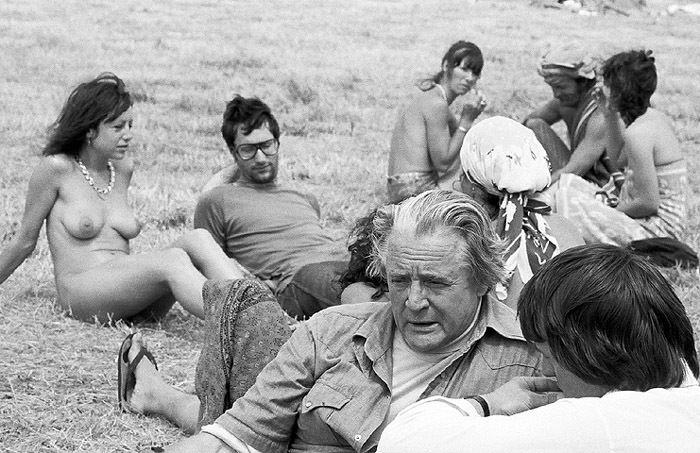 Jim Cairns at Confest, Phillip Island 1980.
the world is in need of more Jims….